An American of proud Scottish descent and a devout Quaker convert, Elizabeth Vining spent World War II writing reports and articles for the American Friends Service Committee. She explained, "Because its work is directed not only to...binding...the wounds of war but to furthering the cause of peace through the healing of tensions and misunderstandings, I had chosen it as my war service to my country." Now that the war was over, Mrs. Vining planned to return to her original career. She had no idea that events were occuring half a world away that would change the course of her life. In the spring of 1946, the emperor of Japan had made the unprecedented decision to hire an American tutor for his son, the crown prince. The qualifications for the position were that the tutor must be a woman, "a Christian, but not a fanatic," and have no experience with Japanese culture or its language, as teaching was to be done entirely in English. When Mrs. Vining read about the emperor's request for an American "schoolmarm" in the press, the idea that she herself might get the job "no more occurred to me than that I might fly to the moon and back on Tuesday." But a college president working on a project with the Friends Committee submitted Mrs. Vining's name and, after only one lengthy interview, the childless widow received word that she'd been chosen for the position. She was to spend one hour per week with the crown prince, teaching him English and "the ways of western democracy," as well as teach a course at the private school he attended with other upperclass children. When she arrived in Japan, an official told her, ""We hope you will open a window to the outside world for the crown prince." Mrs. Vining found the twelve-year-old prince to be withdrawn and isolated -- according to royal custom, he did not even live with the rest of his family -- but she broke down his defenses, calling him by the American nickname "Jimmy" and playing tennis and Monopoly with him. She wasn't afraid to overturn decorum by getting up to demonstrate the difference between the words "hop" and "jump." 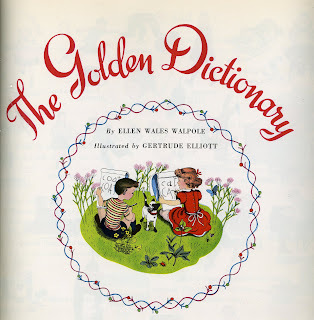 One of the first books she introduced to "Jimmy" was a perennial American favorite, THE GOLDEN DICTIONARY, an oversized volume full of color pictures. She then moved on to other children's books such as THE SHIRE COLT by Jan and Zhena Gay, ABRAHAM LINCOLN by Ingri and Edgar Parin D'Aulaire, and GEORGE WASHINGTON'S WORLD by Genevieve Foster. 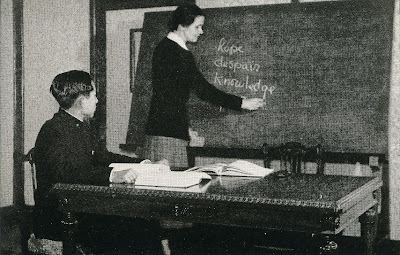 In addition to teaching him the English language, Mrs. Vining is credited with subtly teaching the young prince about independence and individuality -- novel concepts in Japanese culture at that time -- and when she departed Japan four years later, she left this final message on the blackboard for her young students: "Think for yourselves!" Back in the United States, Mrs. Vining returned to her long-delayed "original career" -- writing books, resuming with an account of her experiences in Japan. 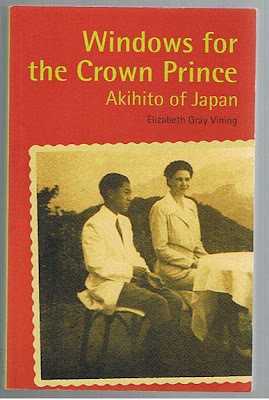 Published in 1952, WINDOWS FOR THE CROWN PRINCE was dedicated "To his Imperial Highness, Crown Prince Akihito." This was the first title she published under her married name Elizabeth Gray Vining. But prior to the war she'd had a flourishing career as an author of children's books under her maiden name, Elizabeth Janet Gray. 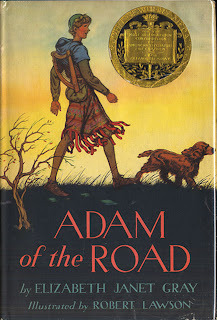 Among her many acclaimed works were three Newbery Honor Books (MEGGY MACINTOSH, 1930; YOUNG WALTER SCOTT, 1935; PENN, 1938) and she'd actually won the Newbery Award for her novel ADAM OF THE ROAD in 1943, just three years before she embarked on her adventure in Japan. Wouldn't you like to see that side-by-side with the Newbery on her mantel? 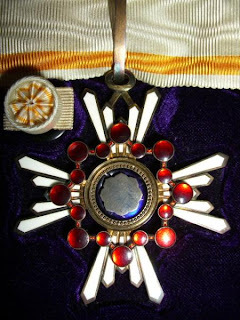 Nice bling. Elizabeth Janet Gray Vining died shortly after her ninety-seventh birthday in 1999. Japan's ambassador to the United States attended the memorial service on behalf of her long-ago student "Jimmy" -- now Emperor Akihito of Japan. What a beautiful story. Thank you so much for sharing it.